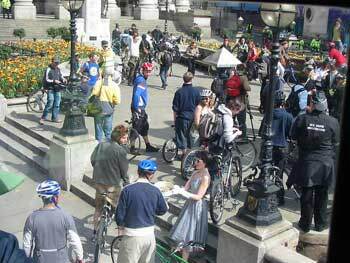 At this point the Mayday Critical Mass arrived on the scene with another group of police on bicycle. 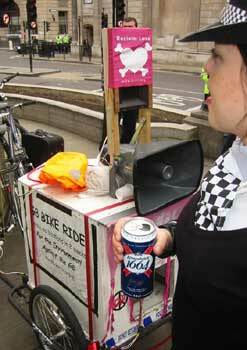 They had brought a much bigger sound system with them, so the tunes could blare out even louder. By this point the party had really started, and police were dancing in the sunshine, some of the moody ones could even be seen to start smiling and tapping their feet. 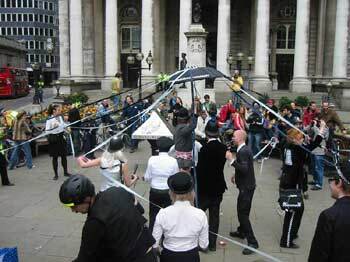 A maypole was erected out of an umbrella and the strapping agent Invasion, although this had perhaps not been planned so well as our agents ended up caught in a tightly wound bundle. 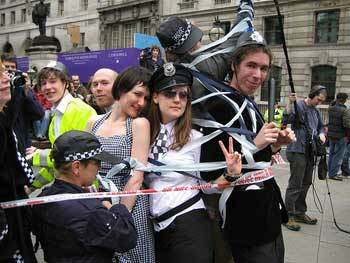 Good job we were on the side of the law this year, we had penned ourselves in. Another game was pulled out, “Bash the pacifist” a variation on bash the rat, and after this a limbo was started with police cordon tape. The sun shone, and we struck up conversation with all of the police present, some made better friends than we had expected. However all good things must come to an end, and the decision was eventually made to move on to Trafalgar square to go and beat up some protestors. We informed the head policeman present that we were going to march to the square. He responded saying he would much rather that we took the tube, even with our amplifiers. Police forward intelligence obviously isn’t that comprehensive, as we had a feeling the tube would be the last place we were allowed. 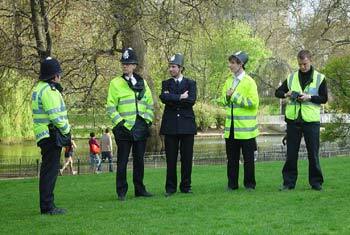 Later as our officers relaxed in st James park after more dancing another riot van turned up to see what was going on. The police surrounded our picnic and watched, we realised that our break must be over and it was time to start work again. 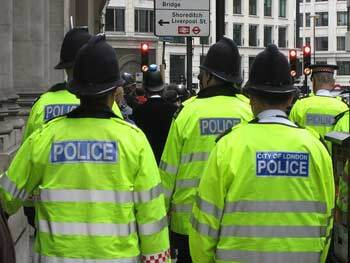 So several of our officers joined their ranks to police the scruffy protestors. Final note, Mayday incase you didn’t know is one of the most important days of the year. Don’t let the bastards grind you down, have fun, and organise something yourself for next year. You might surprise yourself at how much fun a bit of trouble is.